Though a number of birds build their nests at the water's edge, several groups build them out in the water. Coots such as the Common Coot (Fulica atra) and red-knobbed coot (Fulica cristata), build nests which though surrounded by water have a foundation of vegetation, which reaches the ground below. Interestingly the Horned Coot (Fulica cornuta) which breeds on mountain lakes in the Andes where water weed is scarce, build a foundation of stones nearly to water level before building the actual nest. More adventurous are various grebes. Grebes build the nests in shallow water, and though they are often anchored at one or two points they are basically floating on the water. This is necessary because grebes which are primarily water birds are very clumsy on land and find life works better if they can swim right onto the nest. Two other groups of birds build nests which are completely afloat. These are the Jacanas (Lily Trotters) such as the African Jacana (Actophilornis africanus) which build extremely flimsy nests which often sink into the water while the bird is sitting. 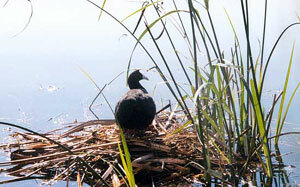 Often if nests sink into the water, they are foated off to a new nest site. Fortunately, the eggs are waterproof so getting dunked regularly does them no harm. The others are the 3 species of Marsh Terns (eg, the Black Tern - Chilodonias niger) which build nests of broken reeds in water up to 120 cm deep. These nests are sometimes anchored to nearby vegetation.